Editor’s note. Our ARTS REVIEW does not make a habit of publishing articles about a CD launch or other commercial enterprise That’s reserved for our advertising section and the $$$ it earns. Ms. Mercer and her team will be an exception! 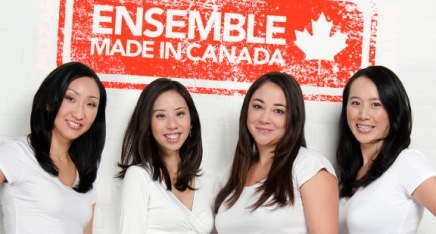 Ensemble Made in Canada is a quartet of superb musicians each of whom has established herself as outstanding in her field. Angela Park, piano, has won numerous awards world-wide and currently teaches at Indiana University. Elissa Lee, violin, an alumnus of the Brott Festival won the 23rd Eckhardt-Gramatt String Competition and has been concertmaster in a number of European orchestras. Sharon Wei won the viola prize at Yale and elsewhere. She has taught at Yale & as of January, will be Assistant Professor of Viola at Western. Rachel Mercer, cello, won the right to play the 1696 Bonjour Stradivarius cello from 2009 2012. She has played in Europe, the United States, the Balkans and Israel as well as across Canada. She currently teaches chamber music at the University of Toronto. Their collective accomplishment and experience is evident in this debut CD where they chose to play Piano Quartet No. 2 in E Flat major by Wolfgang Amadeus Mozart and the Brahms Piano Quartet No. 3. The Mozart Quartet is in three movements – allegro; larghetto and allegretto. Mozart apparently loved to explore the possibilities of the new instrument, the pianoforte, and really liked clarity of music rather than superfluous frills and this is evident in the opening allegro. The piano is often dominant and is crisp and clear; the strings provide support and occasionally take over the melody which leads to a lovely balance between the four instruments. To make this sound so effortless shows flawless technique and a deep understanding of the music. This is extremely high quality ensemble playing. The larghetto dreamily contrasts the rich tones of the cello with the crispness of the piano and the elegance of the violin and viola; and is again beautifully balanced and understated and must require complete concentration and control. The allegretto is much livelier and is the most familiar part of this work. It is cheerful and playful yet also cool and elegant. Parts of it sound like children playing and other parts like graceful people dancing and Ensemble Made in Canada had no problem bringing it to life. It is a joy to listen to this classic, elegant Mozart so beautifully played. The Brahms quartet is in four movements, and opens with a very brooding start which then builds to fraught anticipation – something is going to happen and the listener is not sure what, then is segues into a quiet and lyrical portion containing hints of other Brahms works. Then the first movement ends on a thoughtful note. The short scherzo movement gallops along at a sparkling tempo led mostly by the piano. It is insistent and complex and requires perfect timing from all players. The third movement opens with the cello in its upper register and the piano playing luscious, lazy afternoon music and then the violin and later the viola join in and the four instruments float along together. The fourth movement initially seems like a continuation of the third but with the faster allegro comodo tempo but it rapidly becomes much more dramatic, featuring a subtle and complex interplay between the strings and the keyboard. It ends with a big piano flourish, an apparent fade out and a big final chord. The two pieces are quite different, the Mozart is precise and elegant while the Brahms is brooding and romantic, but Ensemble Made in Canada handled both with technical brilliance and a difficult to explain ‘investment’ in the music – they understood it and clearly loved playing it. This is a superb CD and I hope they make many more, but I am looking forward to hearing these pieces live – no CD can replace that. Magnificent goods from you, man. I have keep in mind your stuff previous to and you are just too magnificent.